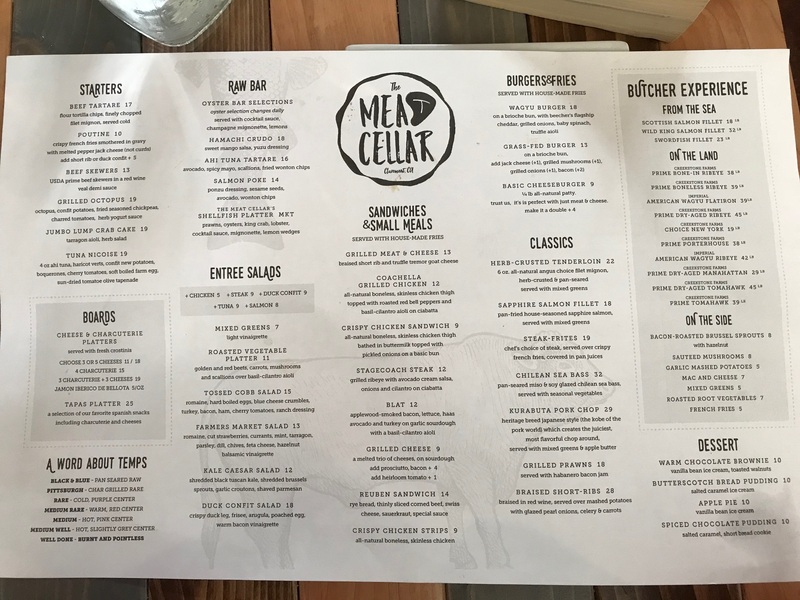 Meat Cellar was already the subject of a Restaurant of the Week post, in 2016, only now it’s moved a few blocks west to the old Wolfe’s Market, and the old location has become a Meat Cellar-owned spinoff, Burger Bar. So it seems best to start over. The new Meat Cellar is probably triple the size, a full-service restaurant with a full bar, an open kitchen and, as before, a meat case like a butcher. That in a way serves as a nod to the space’s century as a grocery until its demise in 2017 (although the back part of the building continues as Wolfe’s Kitchen and Deli). There are two dining areas, one near the bar and the other near the kitchen. 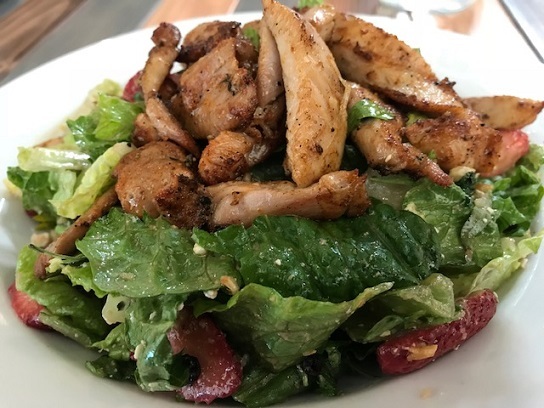 The menu is greatly expanded from the original location; it’s still got the sandwiches, steak frites and other items from before, but now there’s salads, appetizers, desserts, more small plates and far more seafood. 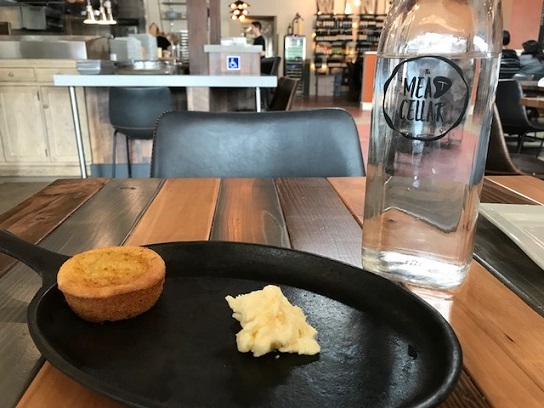 They brought out a piece of cornbread, which was tasty, and a dollop of butter almost the size of the cornbread, which went unused. I ordered the farmers market salad, a new item, with chicken ($13 + $5). It’s got strawberries, currants, romaine, feta and more, plus balsamic vinaigrette. I liked it: It felt like a meal, with chicken and strawberries in nearly every bite. The interior is rustic, with exposed rafters and ductwork, a skylight and wooden slat tables. Service was low-key and professional. 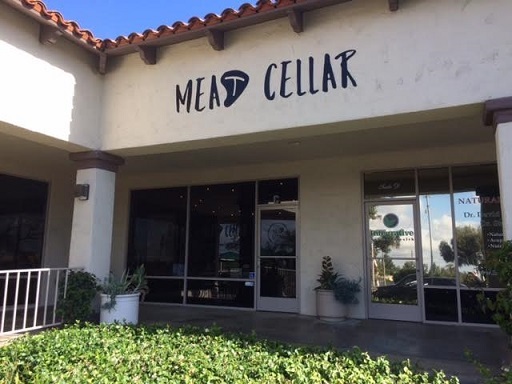 The new Meat Cellar, which opened earlier this year, was a hit immediately; drive past any evening and you’ll see plenty of diners inside through the large windows. 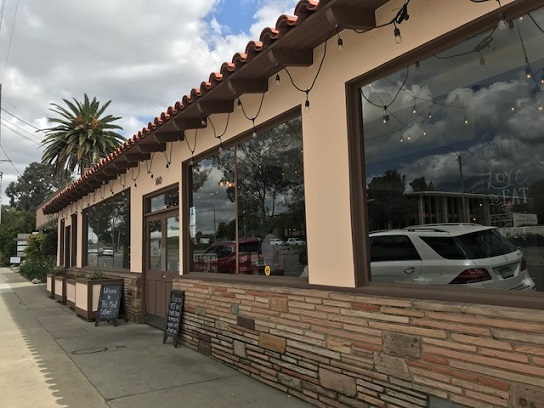 Due to the small parking lot, Meat Cellar has valet parking, possibly the only restaurant to offer this in the Inland Valley, and you’ll see cars parked on the streets around the neighborhood for two or three blocks. It’s a more intense use than Foothill or the primarily residential neighborhood is used to, for sure. But it’s a good use of the space and a great addition to the local dining scene. Congratulations to them. 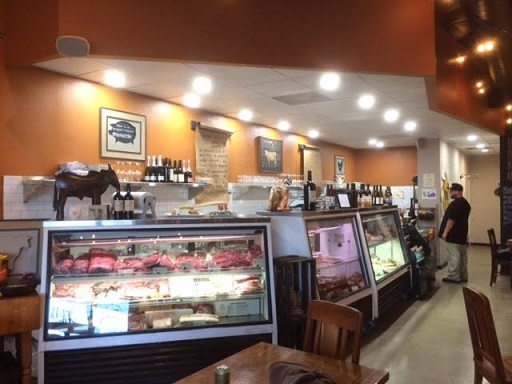 Located at the eastern entrance to Claremont, in the plaza with Blue Fin Sushi, Meat Cellar is a butcher shop that also cooks food to eat in or to go and sells wine. 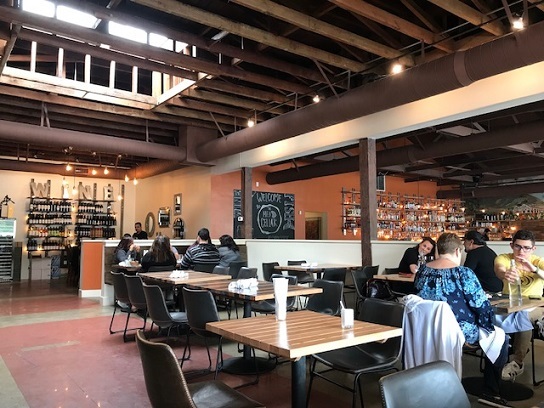 As a frequent visitor to the Starbucks next door, I noticed Meat Cellar as it was going in earlier this year and have been in for dinner three times — which will tell you right there that I like the place. There’s simple seating and you order at the register, past the butcher case. There are a half-dozen specials on the board plus a short printed menu, and they will also cook anything in the case that catches your eye. On one day, the specials were lamb chops, salmon tacos, BBQ pork sandwich, halibut, and muscles mussels with fries, ranging from $12 to $21. 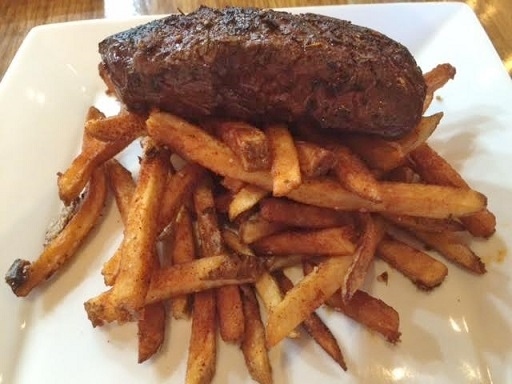 Twice I’ve had steak frites ($19, above), a hanger steak atop a bed of fries, the first time because it sounded good, the second time because I remembered how good the first one was (I was not disappointed). 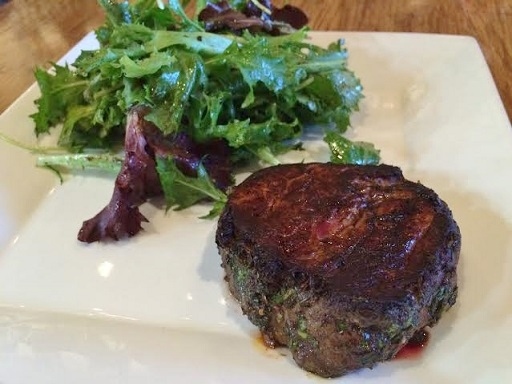 My other visit I got herb-crusted tenderloin with mixed greens ($17, below), another winner. Generally I’ll eat a steak maybe twice a year. I’m not one for the formality, or pricing, of a steakhouse, or one who wants to get a mediocre steak at a cheesy family restaurant. Meat Cellar makes it simpler for me. Also, due to ordering at the counter, tipping doesn’t seem necessary, which makes the meal more affordable (by, well, 15 to 20 percent, right?). They serve beer (from nearby Claremont Craft Ales) and wine. On my visits, the music has been cool, with lots of Bowie, Tears for Fears and the Smiths. The restaurant has no freezer, with all items delivered daily, and all the meat and poultry is organic, antibiotic-free and, as appropriate, grass-fed and pasture-raised. I like it — but then, I said that up top. 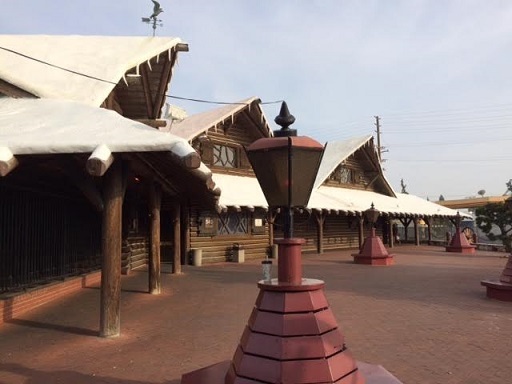 A visual fantasia, this hunting lodge-themed eatery and watering hole in Covina is replete with oil paintings, dark wood, period lamps and stained glass windows, not to mention faux logs and perpetual “snow” and “icicles” on the roof. John Clearman opened the place in 1967 and it still appears to be going strong. 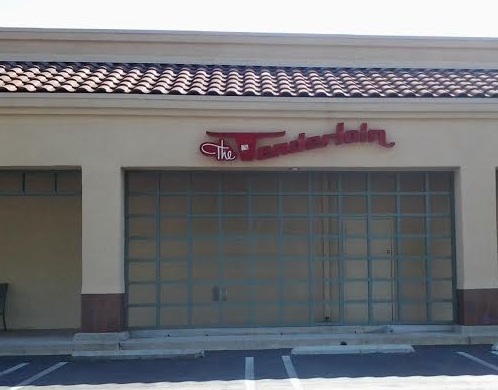 He opened a few other theme restaurants in the area as well, with other North Woods Inns in La Mirada and San Gabriel and a Steak ‘n Stein in Pico Rivera still under the same ownership. He was also responsible for Rancho Cucamonga’s Magic Lamp. LA Weekly wrote a nice history of them all. 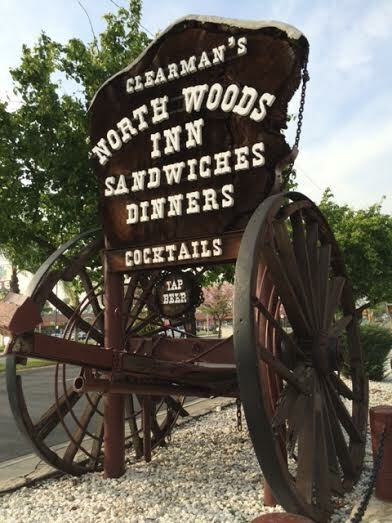 Friends and I used to eat at Covina’s North Woods Inn near Christmas every year, but we stopped, after one friend, incensed that his steak and shrimp dinner didn’t have the number or size of shrimp he was envisioning, put the kibosh on returning. I’d forgotten the whole thing until inviting them all there for my birthday. (He didn’t attend.) I had the idea after revisiting Covina Bowl and realizing it was a block west of North Woods. A two-in-one birthday opportunity had presented itself. We were there for a mid-afternoon Sunday lunch. 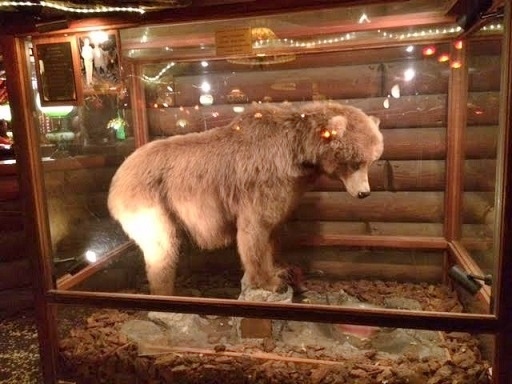 While you wait for a table, you can sit around the center fireplace or take in the surroundings, which include a stuffed bear under glass. 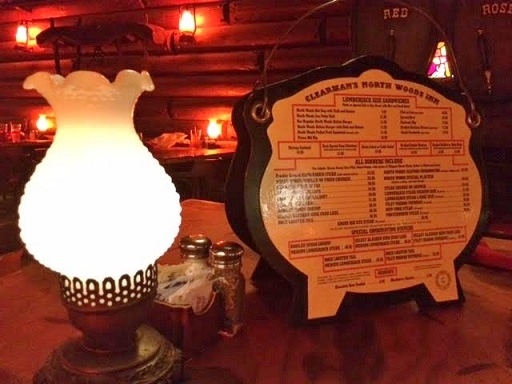 Soon we were seated, at a table that appeared hewn from a log, with a gas lamp on it. The staff all wear red vests. It’s charming to a high degree. The meat-focused menu is mostly steak and seafood dinners, with a few sandwiches thrown in too, and isn’t for vegetarians or light eaters. We had a 9-ounce lumberjack steak ($32), filet mignon ($37), chicken ($23) and the North Woods Special Platter ($31), which came with fish, steak and fried chicken. 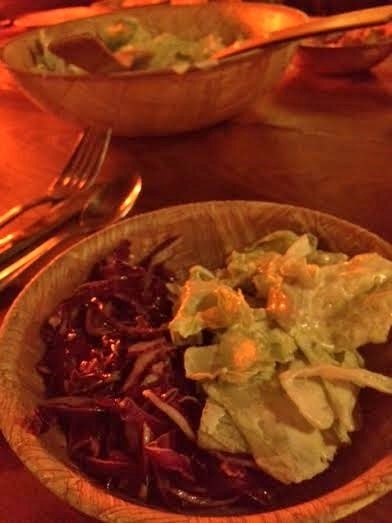 All dinners are accompanied by red cabbage and caesar salads (I had some of each, below) and cheese bread, plus rice pilaf and baked potato. We all liked our food. It wasn’t spectacular, but it was good enough. Two small criticisms: Dinners come with potato AND rice? That’s a little starchy. And the mushroom gravy, which I opted for with my potato, was disappointing rather than a treat. If you haven’t been to North Woods, you should probably go at least once. It’s one of the most unique restaurants in the region and well worth a drive from the Inland Valley. After our three-hour lunch, my friends felt pressed to get back home, so I went bowling on my own. I bowled one game, for a score of 174, my third-highest ever! Thanks, Covina. 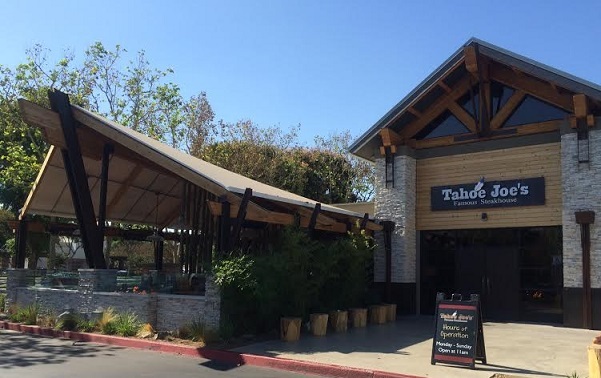 Tahoe Joe’s, a Fresno-based steakhouse chain, opened its first Southern California location on Chino’s restaurant row in July, where it replaced La Creperie, perhaps the steakhouse’s spiritual opposite. Based on the lunchtime crowd Sunday when I visited, it’s a success, compared to my quiet lunch at La Creperie with friends a couple of years ago. 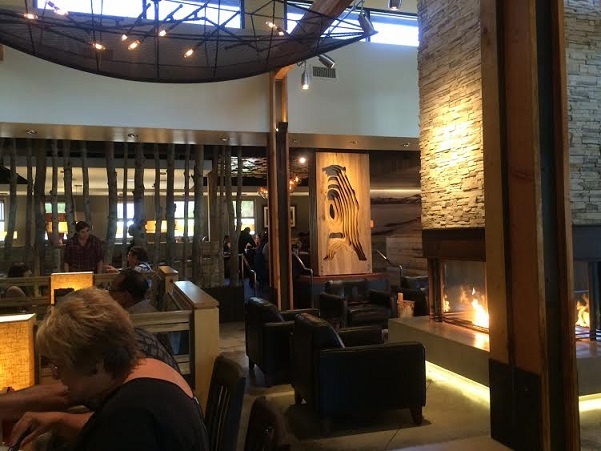 The look reminds me of Lazy Dog Cafe, which is meant to resemble a Wyoming ski lodge; Tahoe Joe’s, modeled on a Tahoe ski lodge, has an expansive covered patio, and the interior has a lot of pine, a stone fireplace near the entry, a bar and, overall, a kind of upscale-rustic feel. Both restaurants are stylish. 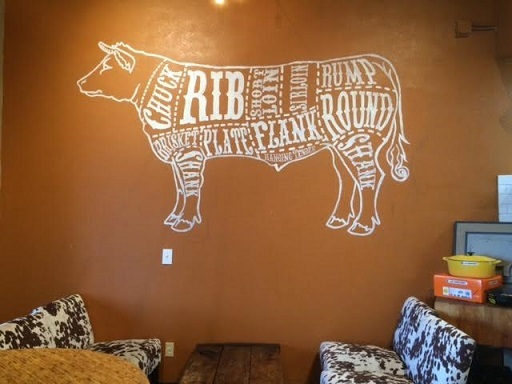 It might also remind you of Wood Ranch BBQ. Incidentally, the Yelp page currently says Joe’s is open for lunch only on weekends, hence my Sunday visit, but a sign out front says it’s open from 11 a.m. daily. The menu has steaks, seafood, salads and sandwiches with entrees ranging from $14 to $31. As you can imagine, Joe’s isn’t vegetarian-friendly, with only one item, a pasta, without meat. 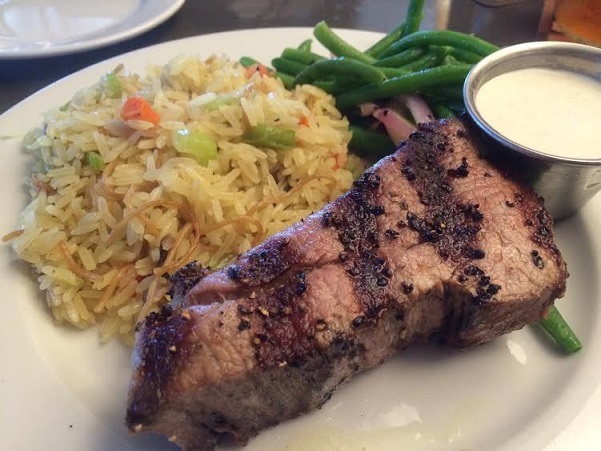 I went with the signature Joe’s Steak, a tri-tip slow-roasted for 19 hours and rolled in black pepper; this came with green beans and a choice of potato or rice (lunch price $14 for the 6-ounce portion). It took a while to arrive — maybe it had only roasted for 18 1/2 hours when I placed my order — and the server volunteered a couple of apologies. Not that I minded, as I brought plenty to read. 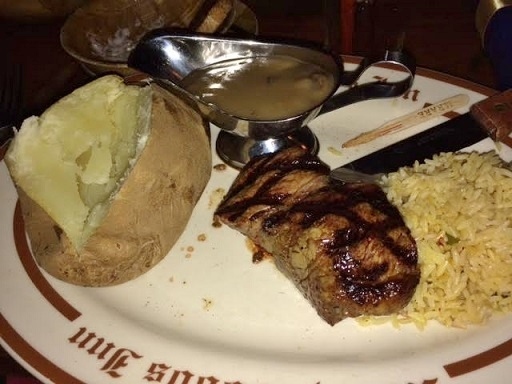 The steak was pretty good, thick-cut and with a smoky taste, and 6 ounces was a good portion (there was a 10-ounce option for a few dollars more). I got rice pilaf as my choice, and I even ate most of my green beans, which I never do. But I passed on their signature cheesecake. For those interested, the bar has 18 beers, a selection of martinis and 20 wines by the glass, and there’s a happy hour. It was a comfortable experience even for a solo diner, and there’s nothing pretentious about the place. Worth checking out, at least if you like meat. In an L-shaped shopping center, the Tenderloin, at the northern end, is easily visible to motorists on Foothill. I’ve seen it for years and wondered if it was a bar, a restaurant or what. The unfortunate connotation with San Francisco’s seedy Tenderloin District made me wonder about the place. As it happens, it’s a steakhouse. I dropped in for lunch Saturday. 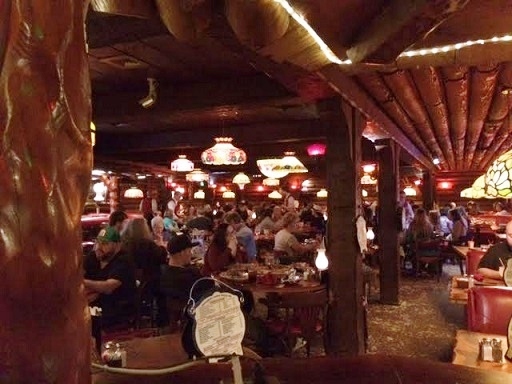 The interior is decorated in Old West style, with several large paintings of Western scenes, and Tiffany-style light fixtures. The lighting is on the dim side. The menu prices are on the moderate side. I had a steak sandwich with fries ($10.79) plus a side salad. The sandwich came with grilled onions, lettuce and tomatoes, on sourdough bread. It was messy but pretty good. The fries and salad were OK.
Service was indifferent. My waitress wore a quilted winter coat over her uniform. Management ought to turn up the thermostat. She also left me without utensils or napkins, which I had to fetch from another table. The Tenderloin attracts an older crowd. A father had three young boys at the booth next to mine, but everyone else was in their 50s or older. On the other side of me, a couple in their 70s may have run out of things to say to each other. They read paperbacks silently during their lunch.